This article originally appeared in the Winter 2013 edition of Plant Healer. If you don’t already subscribe, do it now! It’s my favorite plant publication. Wild Cherry (Prunus serotina) is a valuable member of the North American Materia Medica. The bark of this native tree has a long history of use in our herbal tradition to cool fevers and to treat coughs. The next questions should be “what kind of cough?” We all know that not all coughs are the same, so why treat them that way by providing a one size fits all blend to six, eight, ten different herbs into one preparation? We can be more be far more effective and in the process conserve plant material and save the people we help from unnecessary expense or treatment when we study our materia medica, educate ourselves about energetics and apply some precision. Wild Cherry Bark is a true antitussive, that is, it sedates or suppresses the cough reflex. Most of the time, holistically oriented herbalists don’t suppress bodily processes. Instead we try to support the body as it moves through illness, enhancing the body’s natural mechanisms of healing like increasing surface circulation to open the pores and provoke sweating during a fever, rather than suppressing a fever. Or we may actually enhance the cough in order to help the body remove mucus by using moistening expectorants. We moisten the dry, relax the tense, cool the hot and so on. However, an antitussive can be the perfect remedy when the cough is irritating, spasmodic and not productive. Wild Cherry can also be used when coughs linger after the infection seems to be over and coughing fits are triggered by going out of doors during cold weather or doing some exercise or even laughing. The individual has nothing to cough up, he or she just keeps coughing. The respiratory tract is irritated; it’s stuck in a pattern that doesn’t serve any usefulness, like a guest that just won’t leave. Wild Cherry is perfect for the lingering coughs of bronchitis, pertussis and pleurisy. Wild Cherry Bark is a strong heat reducer and the anti-inflammatory action makes it useful in acute and chronic sinus inflammation and allergies characterized by inflammation. For allergies with much heat it combines well with relatives like Hawthorn, or other heat reducers like Linden. There is also a history of use as a nervine sedative useful for people who experience heart palpitations or a racing heart. Wild Cherry Bark can also be used herpes and shingles. Herpes and shingles are almost always treated by cooling, anti-inflammatory anti-viral herbs. Consider combining Wild Cherry with herbs like Lemon Balm, St. John’s Wort or Linden. Wild Cherry Bark contains cyanogenic compounds including prunasin and amygdalin. These cyanogenic glycosides are present in many members of the rose family. These compunds lend the tincture a slightly almond like odor and flavor. Incidentally, almonds and cherry are both members of the Rose family. Peach leaf or twig tincture has a similar almond odor and flavor. The seeds of other Rose family plants, like Apples, that are otherwise non-toxic, contain cyanogenic chemicals, thus the reputation that Apple seeds have for being poison. It is for this reason that Wild Cherry Bark is not harvested in the late Winter/Early Spring when the sap is running, like other medicinal barks. Instead, it is preferable to harvest the bark during the midsummer when cyanogenic compounds are reportedly lower. Avoid use of the pits of the fruit. Experts generally discourage the long-term use of plants with cyanogenic glycosides. Although we are right to be cautious and careful in our use of all herbs, Wild Cherry can be used very safely, including with children. Mills and Bone state that “although hydrocyanic acid (cyanide) is a poison, oral intake of prunasin is not necessarily toxic, as hydrolysis in the digestive tract or by the liver leads to a slow release of very low levels of hydrocyanic acid, which can readily be detoxified by the body.” There are reports of livestock poisoning with Wild Cherry, however, it is important to remember that livestock eat very large amounts of plant material relative to their body weight and when restricted in locales where choices for forage are limited this amount relative to body weight will be vastly larger than the amount consumed by an individual human for medicinal purposes. It also seems that many reports of livestock poisoning involve the wilted or damaged leaves, which apparently, are considerably more toxic than fresh leaves. In my family and my practice I use Wild Cherry Bark only when the person shows signs of heat and inflammation including a cherry red tongue or anterior third of the tongue. When used in an inflamed and overheated individual I find that doses of less than 5 drops, from two times daily to several times daily are effective. However, other herbalists who favor larger doses suggest dosage ranges of 1 to 6 ml daily (Mills and Bone, Hoffmann). There is great variation in the literature regarding how to prepare Wild Cherry Bark, including suggestions to use bark that is cold infused, boiled or dried. I like to keep it simple and use a folk style tincture of fresh, unprocessed (not boiled or dried) summer harvested bark, at about a ratio of 1 part bark to 5 parts 80 proof vodka and have found this type of preparation to be effective. The tincture is a lovely deep red color, tastes fruity and has both the smell and taste of almonds, although not as strongly as a peach leaf or twig tincture. When you have learned to positively identify Wild Cherry it’s also a remarkably easy remedy for the wildcrafter to obtain. Wild Cherry is a common and widespread tree where I live in Minnesota (excepting the arrowhead region and the Southwest corner). Wild Cherry can be found across the Eastern half of the United States including New England, the Mid-Atlantic states, the entire American South and upper Midwest, many of the plains states and even parts of Texas and the Southwest. Foresters, arborists, botanists and wild foods enthusiasts, use the common name Black Cherry to describe Prunus serotina; Wild Cherry is preferred by the herbalists alone. Wild Cherry is one of our native hardwoods. It has a narrow crown and can be quite tall, with the tallest representatives being about 100 feet tall, but it never attains the girth of other tall trees like Cottonwoods, Bur Oaks or many Maples. The mature Wild Cherry has a really unusual bark. The bark breaks into irregular scales with upturned edges. The scales are described sometimes as like “burnt cornflakes” or “potato chips”. 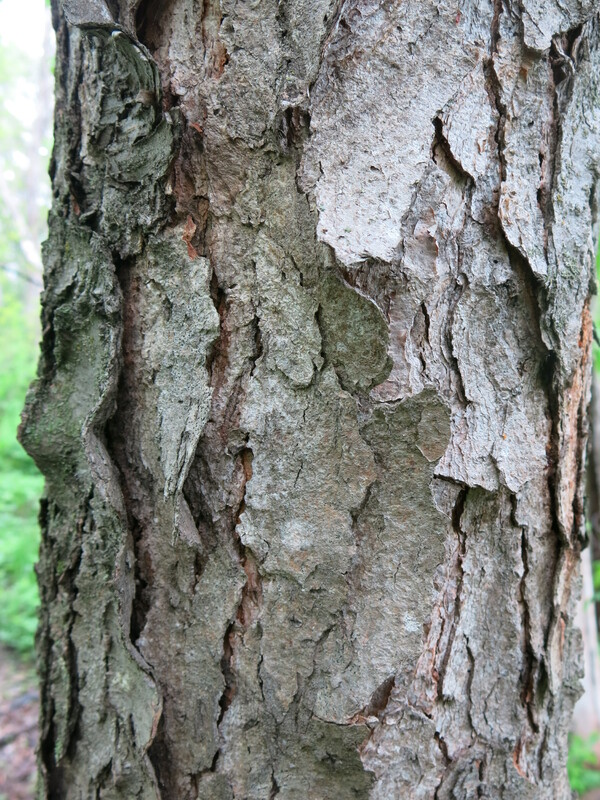 This scaly bark may appear reddish brown to blackish. The bark is one of the best identifying characteristics of this tree. Unfortunately, the mature trees are quite tall and it can be a challenge to reach the branches you need to harvest the bark. The wildcrafter needs to find a young Wild Cherry. This is the bark of smaller limbs from the same Wild Cherry tree pictured above. Note the smoothness and the horizontal lenticels. Above is a picture of the bark from the younger, smaller limbs of the same Cherry tree pictured above. 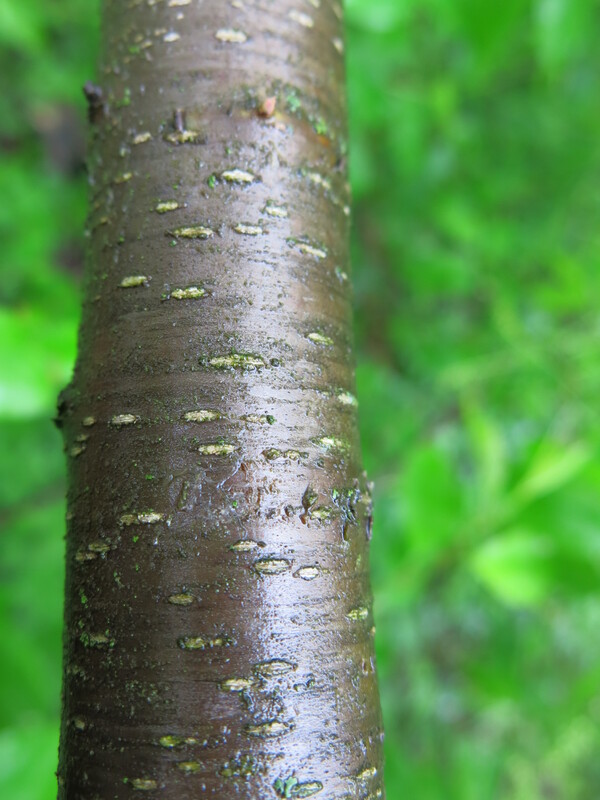 Note the smooth, shiny bark and the horizontal lenticels. This is where it gets complicated. Young Wild Cherry trees look very similar to Chokecherry. Chokecherry (Prunus virginiana) is a close botanical relative of Wild Cherry. They are both members of the Prunus genus. The bark of Chokecherry is nearly indistinguishable from the bark of a young Wild Cherry. Wild Cherry Bark has oval leaves with a slightly serrated edge that is characteristic of plants in the Rose family. 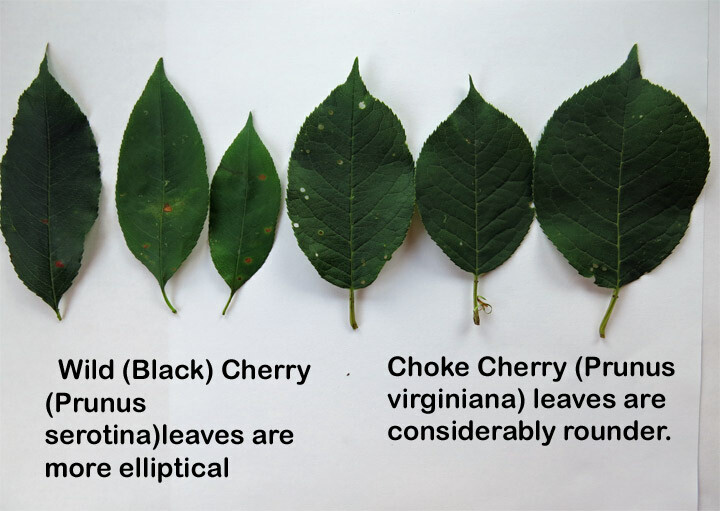 Some sources state that the leaves of Wild Cherry are “generally narrower and more elliptical than those of choke-cherry,” (Smith, p. 362), and in my experience this largely holds true. However, this is not a foolproof identification characteristic. Leaf size and shape can vary a bit within each species. When I am looking at Wild Cherry or Chokecherry leaves. I always flip over the leaves. Many Wild Cherry leaves will have tiny rusty or orange colored hairs along both side of the midrib near the bottom third of the leaf. (By bottom I refer to the part of the leave closest to the stem or petiole). 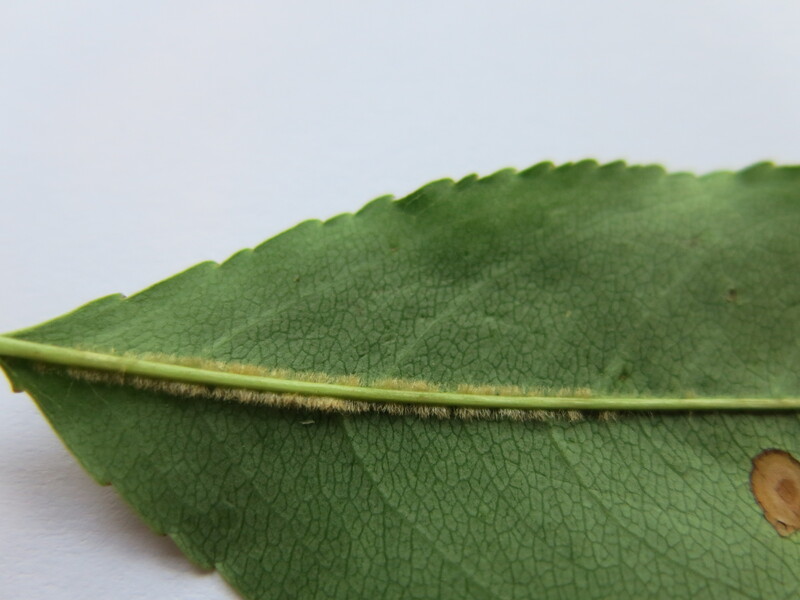 Not all Wild Cherry leaves have these hairs, but rusty orange leaves on the midrib are NEVER present on Chokecherry leaves. For this reason, this is my personal favorite means of differentiating between young Wild Cherry and Chokecherry trees. Flowers, and later, berries, are born on racemes. Flowers are small and have 5 petals, 5 sepals and multiple stamens characteristic of the Rose family. Flower blooms from mid-May to mid-June in the upper midwest. In general, chokecherry blooms a week or so before Wild Cherry. Below are two pictures, taken on the same day, in the same location, one of a Wild Cherry raceme, with tightly closed buds and one of a Chokecherry in full bloom. A Wild Cherry Raceme that hasn’t bloomed yet. When Wild Cherry bark is scraped or when a twig is snapped you can smell a characteristic almond odor. Some sources name this odor as unpleasant or rank Personally, I like it and don’t find it unpleasant at all. That almond odor helps identify Wild Cherry but is not a positive id characteristic. Some, although not all, Chokecherry shrubs will also emit an almond odor. I have heard some people suggest that only Wild Cherry is affected by the Black Knot Fungus and that presence of the galls is a positive identification characteristic of Wild Cherry. This is not true. Many members of the Prunus genus are highly susceptible to Black Knot, including American Wild Plum, Chokecherry and Wild Cherry. What happens if you accidentally make medicine from Chokecherry? Nothing bad! No harm done. In fact, there is some history of using Chokecherry in place of Wild Cherry. There are differences between them medicinally. Matthew Wood writes: “Mid-nineteenth century literature often confuses the identity and uses of these two agents. Chokecherry is a powerful astringent, whereas wild cherry is a sedative. The former is thus used for diarrhea and dysentery,” (Wood, p. 286). I haven’t made medicine from Chokecherry and can’t speak to that from personal experience. However, if your intention is to make use of Wild Cherry’s incredible heat-reducing properties, learn to positively identify Wild Cherry. Besides, it’s fun to get up close and personal with the plants and know them intimately and what makes them different from their neighbors. It deepens your relationship with the natural world. You’ll want to make sure you don’t mistake Buckthorn for either of these trees–you or the recipients of your medicine would be in for a purgative surprise! Buckthorn is a medium shrub with smooth ovate/elliptical leaves and small black fruits. It is a strong, strong laxative. Note that Buckthorn flowers are born in umbels– not racemes, at the base of 1st year branchlets (Smith, p. 394). Neither Wild Cherry nor Chokecherry have thorns or thorn-like branchlets. The flowers of other Rose family trees and shrubs also have five petals and five sepals, but usually the individual blossoms are larger. 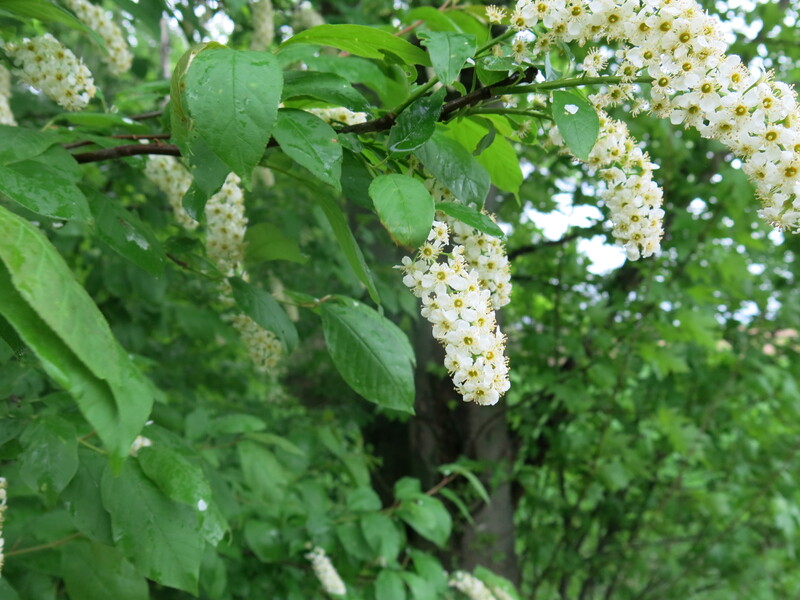 Wild Cherry and Chokecherry both have flowers on a raceme. Other plants like American Wild Plum, Hawthorn, Apples and Crabapples have different floral arrangements. Cook, Wm H. “Prunus Virginiana. Wild Cherry.” The Physio-medical Dispensatory: A Treatise on Therapeutics, Materia Medica, and Pharmacy, in Accordance with the Principles of Physiological Medication. Cincinnati: Wm. H. Cook, 1869. N. pag. Henriette’s Herbal Home Page. Web. <http://www.henriettesherbal.com/eclectic/cook/PRUNUS_VIRGINIANA.htm&gt;. King, John, Harvey Wickes Felter, and John Uri Lloyd. “Prunus Virginiana (U. S. P.)—Wild Cherry.” King’s American Dispensatory. Cincinnati: Ohio Valley, 1898. N. pag.Henriette’s Herbal Home Page. Web. <http://www.henriettesherbal.com/eclectic/kings/prunus-sero.html&gt;. Mills, Simon, and Kerry Bone. The Essential Guide to Herbal Safety. St. Louis, MO: Elsevier Churchill Livingstone, 2005. Print. Smith, Welby R. Trees and Shrubs of Minnesota: The Complete Guide to Species Identification. Minneapolis, MN: University of Minnesota, 2008. Print.Tekiela, Stan. Trees of Minnesota: Field Guide. Cambridge, MN: Adventure Publications, 2001. Print. Thayer, Samuel. Nature’s Garden: A Guide to Identifying, Harvesting, and Preparing Edible Wild Plants. Birchwood, WI: Forager’s Harvest, 2010. Print. I struggled for half a year to ID 2 leaves and few fruits (“black wild cherry”) I was ask to propagate. The taste of the fruit was much better than any chockecherry I tried before, so for a while I believed it is serotina. Great idea to put leaves side by side and pick few to illustrate certain variability. Mine happen to be P.virginiana, based on shape of the leaves, more pronounced veins, and lack of hairs. I have 3 seedlings waiting for outdoor planting…. Thanks,Chris. I’m glad it was helpful for you. It’s pretty easy to tell a mature P. serotina from P. virginiana just by size and bark alone but when they are young they look so similar! Are you able to tell me if Cherry trees can have long spikey thorns? If I send you a picture would you be able to tell me if it is a cherry or a blackthorn? I have never seen a Wild/Black Cherry (Prunus serotina) with thorns or thorny branchlets. 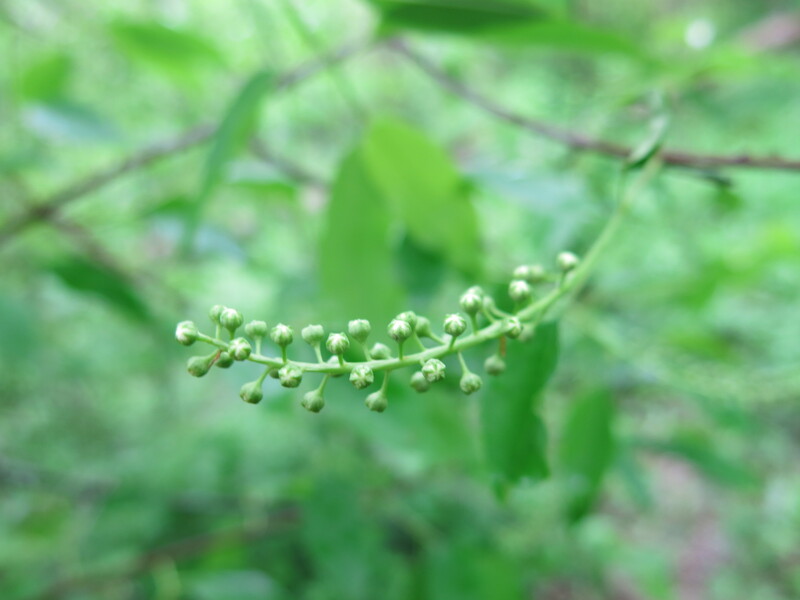 Nor have I seen a Chokecherry (P. virginiana) with thorns or thornlike branchlets. Plum trees are pretty closely related and many plum trees have thorny branchlets. Another relative, hawthorn, has thorns. There are many species of hawthorns and the way the thorns present can vary. At first glance, or to those new to plant id, buckthorn, can look like a young wild cherry or chokecherry, and they have thorns. Fee free to send or post a couple of pictures. I would be happy to look at them. However, I am familiar with plants and trees of the upper Midwest, so if you are located in the south or west coast, you may be looking at a plant I am not familiar with. Next article August is Complimentary Bath Bomb Month!